“Shadow Dancer” (2012 production, 2013 release). Cast: Andrea Riseborough, Clive Owen, Gillian Anderson, Aidan Gillen, Domhnall Gleeson, David Wilmot, Brid Brennan, Cathal Maguire, Martin McCann, Barry Barnes, Maria Laird, Ben Smyth. Director: James Marsh. Screenplay: Tom Bradby. Book: Tom Bradby, Shadow Dancer. Web site. Trailer. Belfast, Northern Ireland was an explosive place in 1973. The long-simmering conflict between the militant Irish Republican Army and British troops deployed to maintain order flared up routinely at the time. Street clashes frequently erupted, often claiming innocent victims caught in the cross-fire. Such was the case for a young boy (Ben Smyth) who was shot and killed while running an errand, one that was supposed to be handled by his older sister, Collette (Maria Laird). Outraged by the tragedy, in ensuing years, the young girl and her two surviving brothers vowed to exact revenge against the British authorities they believed were responsible for their sibling’s death – by becoming IRA operatives. Flash forward 20 years to 1993, a time when the IRA and British authorities were earnestly seeking to make peace. It represented a major step forward in relations between the two combatants, but not everyone in the IRA’s ranks was satisfied with the peace talks. Fearing that the IRA leadership was conceding too much, some of the organization’s more radical elements were convinced that they should continue their guerilla tactics, carrying out targeted assassinations and terrorist attacks in retribution for what they perceived as ongoing British oppression. These sentiments are depicted in the film when Collette, now an adult (Andrea Riseborough), is charged with placing an explosive device in a London subway station. But the plot is foiled by the British intelligence agency MI5 before she can carry it out. Once Collette is in custody, one of MI5’s field agents, Mac (Clive Owen), offers his captive a deal – that she act as an informant to spy on the activities of her brothers and fellow IRA operatives, Gerry (Aidan Gillen) and Connor (Domhnall Gleeson), in exchange for staying out of prison. As a single mother of a young son (Cathal Maguire) who faces the prospect of not seeing her child once incarcerated, she reluctantly agrees to Mac’s offer. It’s a move that quickly puts her life in jeopardy from those in close quarters who now have suspicions about her, questioning where her true loyalties lie. And, despite Mac’s reassurances, she fears for her safety, not only from the possible reprisals of her “peers” but also because maintaining her cover requires her to continue engaging in the kinds of dangerous activities her spying was intended to prevent. But Collette isn’t the only one who experiences challenges in carrying out her undercover mission. Before long, Mac discovers that there are others who appear to be working against him, too. He consults his superior, Kate Fletcher (Gillian Anderson), for guidance, an inquiry that only leads to even more puzzling questions. And so, as events play out, both the spy and the spy master are thrown into a web of intrigue where they’re left to fend for themselves. The question is, though, will they be able to find out enough in time to keep themselves alive? When we employ conscious creation to manifest the reality around us, we serve ourselves best when we do so from the standpoint of personal integrity and truthfulness. Failing to do so can easily lead to conscious creation gone awry, with “unintended” outcomes and unwanted results bring thrust upon us and, potentially, others who get caught in the cross-fire (not unlike what happened to Collette’s brother at the film’s outset). But, as obvious as such advice might seem, why don’t we religiously follow it? How do we allow our intents to become twisted or corrupted? Shouldn’t we be able to keep such untoward influences from impacting what we’re seeking to materialize? Unexpected outcomes can result in several ways. In most cases, we wind up with unwanted results by failing to be clear with ourselves about what we’re seeking to create. Either we’re foggy about the beliefs we employ to manifest our reality, or we allow competing beliefs to conflict with one another during the manifestation process, or we underutilize our intellect or intuition in forming the beliefs we use for materialization purposes. In all of these instances, the results we realize invariably conform to these “faulty” intentions, accurately reflecting what we put into them, even if they’re not what we thought we were trying to achieve. In other cases, the outcomes we experience can be the result of mass co-creations in which we contribute to what arises, even though we’re only part of the overall equation. We may successfully participate in creating our respective portions of the outcomes, but the overall results stem from the input of numerous contributors, some of whose intents may not align with – or may even blatantly contradict – our own. We might experience some satisfaction with the results in such situations, but we’re just as likely to find fault with at least some of what appears, too. Collette and Mac both experience such circumstances as their respective stories unfold. To materialize what each of them truly wants, they must scrutinize their creations to discover what beliefs – both those of an individual and of a collective nature – have contributed to producing what they experience. This can be challenging, given that each of them dances in the shadows of the murky worlds of espionage and subterfuge, routinely engaging in actions that are intentionally deceitful. Under such circumstances, then, is it any wonder that things don’t always turn out as hoped for? Collette’s and Mac’s experiences thus offer us clear, concise cautionary tales about the pitfalls we should all seek to avoid if we hope to steer clear of the kinds of difficulties they and their peers ultimately encounter. Indeed, intentional deception can become a trap, both for those who create it and those who are impacted by it. 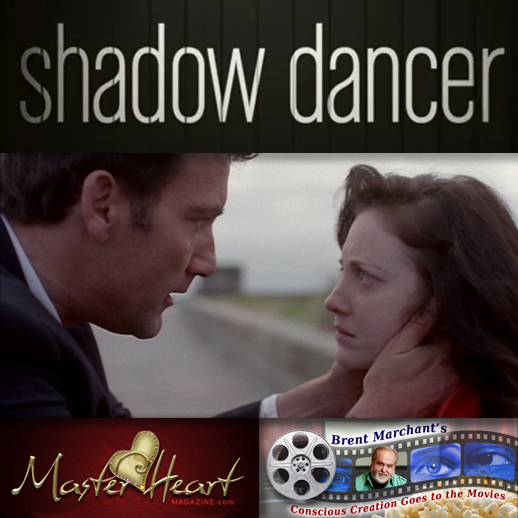 “Shadow Dancer” is a well-crafted thriller that slowly sizzles to a powerful climax. Its taut, well-written screenplay is subtle (sometimes even a bit too subtle) but effective in telling its compelling story (you have to watch this one very closely to get the full gist of what’s going on). The film features a great collection of performances, especially by Riseborough, who turns in some of her best on-screen work to date. The pacing is a bit slow in the first 30 minutes, and the sound quality (considering the characters’ thick Irish brogues) leaves something to be desired at times, but these shortcomings don’t detract significantly from what is otherwise a riveting time at the movies. The picture is primarily playing at theatres specializing in independent and foreign cinema, but it’s worth searching for, even if it’s not showing at the neighborhood multiplex. The perils of deception can wreak havoc in our lives and the lives of others. But, if we strive to create an existence based on genuine intents, we stand a much greater chance of avoiding difficulties that can carry significant consequences. “Shadow Dancer” illustrates these principles effectively, bringing to light the importance of employing honesty in all that we seek to create – and the price we’ll pay if we don’t.